It is more fit for home entertainment in dark condition.Not recommended for presentation in the teaching room or meeting rooms.because in the daylight the projection screen can not have good effect as dark places. The projector has internal sound. If you want the projector provide high quality sound, you can use external sound boxes or speaker via 3.5mm Audio jack by wire. you can use HDMI cable to connect them which is stable and simply operating. 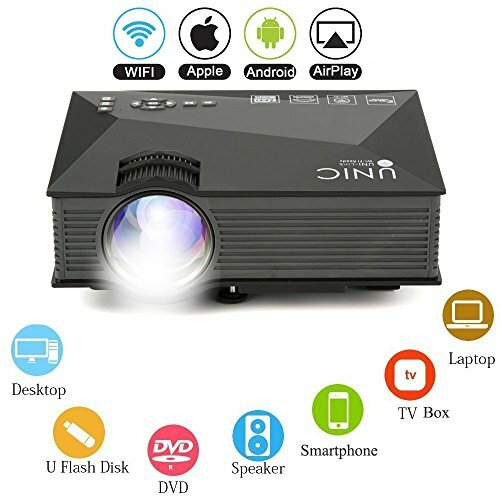 Furthermore, you can use wifi to connect projector and your computer, you will use DLNA function to show the same contents between the computer and projector. Besides, your computer system should be above IOS 6.0 and Win 8.1 system. Before using it please confirm a good network condition. Wifi Function:Support wifi wireless connecting with the above Android 4.2.2, IOS 6.0 and Win 8.1 system.Before using it please confirm a good network condition. LED Lamp:Best experinence of watch with LED lamp（Brightness: 1200 Lumens; Original Resolution:800*480; Contrast: 800:1;).Given the projector a break after working 4-5 hours avoiding overheating. Display: image size: 34-130 Inches, projection distance: 3.51 to 12.47 Feet. adjusting the Lens on the projector to focus the image. Choices of Input Interfaces:Connect TV Box / Laptop / DVD Player / PS3 / PS4 / Xbox via HDMI port;Connect PC via VGA port;Connect external sound box or speaker via 3.5mm Audio port.Connect USB or Mobile Hard Disk via USB port;Connect USB 5V Output to charge other devices. For entertainment: Not recommended for teaching, meeting or business presentations.Anywhere,anytime, ideal for home theater movies and video game.just take it for fun---Homing entertainment and travel camping, outdoor party,family dinner or BBQ Party.